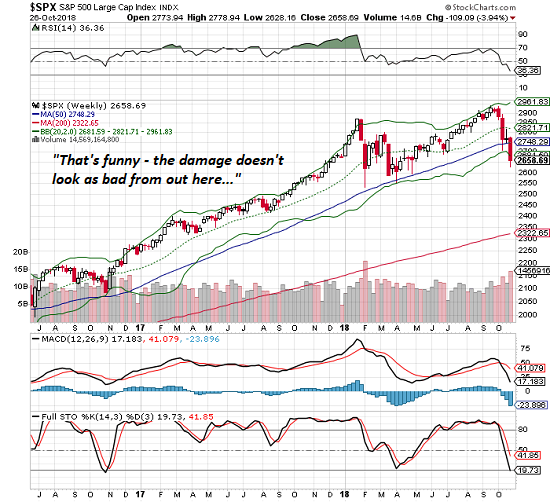 What's the Real Meaning of the Stock Market Swoon? Nobody dares discuss it openly for fear of triggering a panic, but there aren't enough lifeboats for everyone. -- complicated currency / FX reserves dynamics, mostly involving China's attempts to control its currency while propping up its domestic credit bubble and tightening the screws on capital flows. My explanation is much more simple: the status quo is fragile, and everyone's grip on the crumbling cliff-edge of "prosperity" is precarious--and we all sense it. The security we all took for granted is turning to sand as the system breaks down. Job security--you're joking, right? Pension security--you take us for chumps? Sure, your bank account is guaranteed by the FDIC, but nobody's guaranteeing your income, your purchasing power or the security of your grasp on the good life. Everyone knows the markets are as precarious as the rest of the status quo, and the rational response is to limit exposure to risk by selling at the first signs that the herd is nervous. 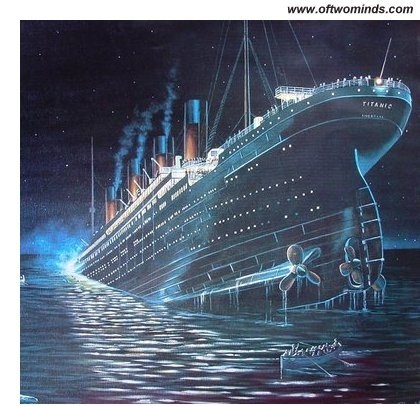 Switching metaphors, we all know the global economy scraped alongside an iceberg in 2008, and those who look beneath the reassuring rah-rah know that the hull of the global economy was sliced open just like the Titanic's. Central banks have created the illusion that the damage was limited by printing money and using the freshly created currency to buy bonds and stocks to prop up the markets. But even the passengers who accept the authorities' reassurances sense something is wrong with the ship. The bow is slowly sinking, the engines are straining to power the pumps, the First Class passengers are either already in lifeboats or huddling nervously by the davits, and the ship's officers are openly wielding pistols to control panic. Nobody dares discuss it openly for fear of triggering a panic, but there aren't enough lifeboats for everyone. A great many passengers are going to find themselves in the icy waters when the great global economic ship finally founders, and humanity's finely tuned instinct is alerting us to the restless nervousness of the herd. This particular near-stampede may well be calmed down, and naysayers punished by a monumental rip-your-face-off rally to new highs, just to settle any doubts that the great ship isn't sinking. Rather, the party on the first class deck is just getting started, and a few bottles of champagne might make it down to the 2nd class deck or even to a lucky few in steerage. But despite all the reassurances and rallies, we all sense the fragility and precariousness. No wonder the first hint of trouble triggers a stampede. Just about the only bulwark against being silenced by the modern-day tech-corporate-NKVD-Stasi is Patreon. If you do a search of shadow banning, you'll find sites that claim to help you identify whether Twitter or Instagram has shadow banned your account. The basic idea of shadow banning is to spoof the shadow-banned user into believing their public posts are visible to all while in reality the posts are visible only to the user or in some cases to the users' followers. "Shadow banning (also called stealth banning, ghost banning or comment ghosting) is the act of blocking or partially blocking a user or their content from an online community such that it will not be readily apparent to the user that they have been banned." Here is whatis.com's description: "Shadow banning is controversial because it allows an administrator or moderator to effectively become a censor and prevent specific users from interacting with other members of an online community on an equal basis." Shadow banning and outright banning are only the tip of the iceberg: everyone who posts content on the web or social media is subject to much more subtle and completely opaque controls on how much of your digital presence has been ghosted--not just in social media communities but in searches and how links to your site/content and re-posts of your content are handled by the tech cartel that controls what's visible and "found" on the web and social media. 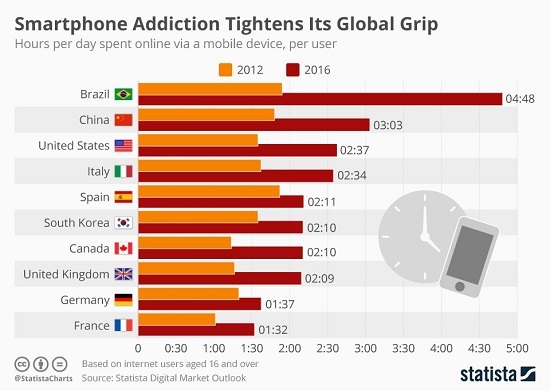 This cartel is dominated by Google and Facebook. 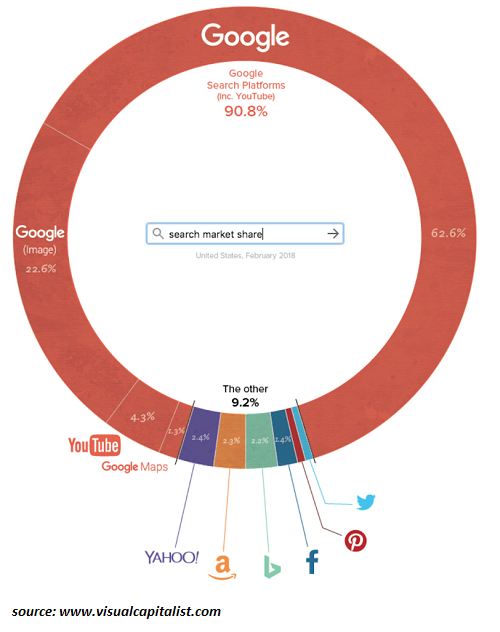 Google controls over 90% of all search: what search results are displayed, the weight given to links (the page-rank assigned to websites) and a variety of other factors that can be depreciated, removed, omitted or blocked by algorithms and/or human censors (a.k.a. administrators) without recourse and without the site or user being informed. 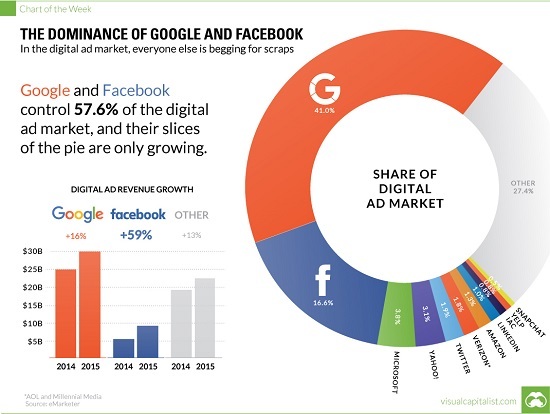 While this chart displays the dominance of Facebook and Google in digital ad revenues, it is a rough proxy for their dominance in mindshare, user data collected and control over what is displayed and not displayed in search results and social media. We are all digital ghosts now, and how much of your digital shadow is visible to the world is secret / opaque. If you violate company policies or applicable censorship laws (as interpreted by the company attorneys), the corporation will notify you that your account has been frozen or banned. In these instances, users and content creators are informed of their purported violation. But this visible part of web / social media censorship is only the tip of the iceberg. Most of the censorship is invisible and undetectable. Here's an example of how this might work. Facebook has reportedly based one of its censorship programs on the demonstrably bogus (and anonymously produced) PropOrNot list that was hyped by the Washington Post in 2016. The list of sites accused of being Russian propaganda outlets was a grab-bag of left, right and center websites whose only "crime" was publishing some bit of skepticism about the coronation of Hillary Clinton. So a bogus anonymous list becomes the foundation of Facebook's censorship efforts. This is precisely how the former Soviet Union's secret police operated: a falsely reported association became the foundation of surveillance and the setting of various traps and snares to catch anti-social elements in the act of undermining the regime. That the association was false no longer matters. What matters is your name is on the list. It turns out oftwominds.com made it on the modern-day NKVD-Stasi list of PropOrNot, which despite being debunked has taken on a life of its own in the New Police State of Facebook, Google, et al. It happened to oftwominds.com this month. I have traffic data going back to 2005, and my traffic (visits and page views) has been remarkably steady for years. The number of my posts per week remains the same, my engagement on social media remains the same (as far as I can tell, heh) and my page rank remains the same (5) (again, as far as I can tell). So when my traffic drops like a light switch was flipped, I notice. 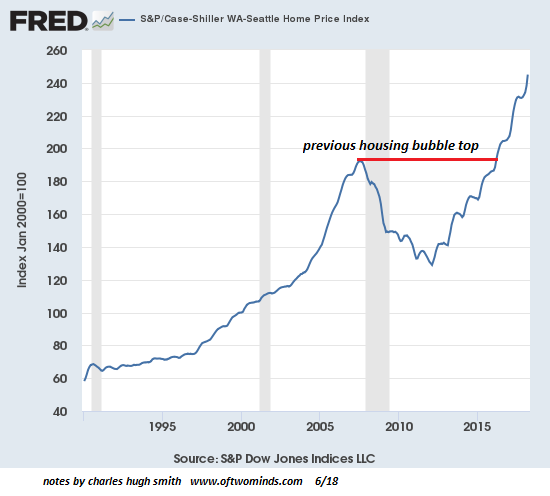 I hope you'll enjoy the irony that many if not most of the charts published on my site are from the Federal Reserve Economic Data site (FRED). But this is akin to the innocent citizen snagged by the NKVD or Stasi for unspecified crimes against the people protesting his innocence and good citizenship: none of that matters. What matters is your name is on the list, and our administrators are obligated to track your digital presence and digitally ghost you by adjusting search results to depreciate your presence, underweight links from other sites, jam attempts to re-post your content and so on. None of this is visible or reported. It all happens behind the closed doors of Facebook, Google et al. Just as loyal employees of the NKVD and the Stasi were constantly told they were the bulwark of the people against enemies of the state, employees of Facebook, Google et al. 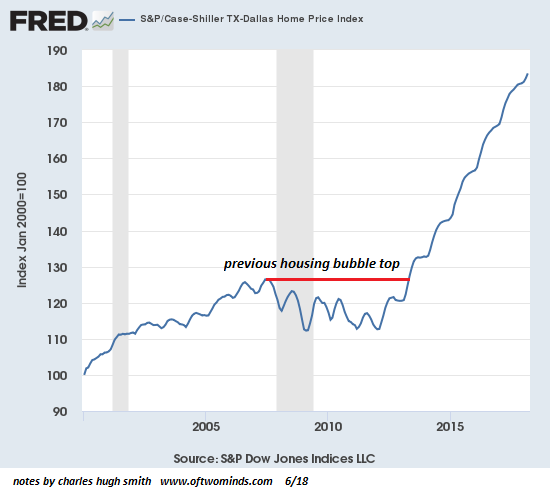 are told they're weeding out "fake news" and "propaganda" (like those charts from the Federal Reserve Economic Database) that is disruptive and divisive. In other words, they're good Germans doing their masters' bidding, for very handsome salaries, bonuses and stock options. Meanwhile, the incomes of those secretly ghosted without trial or recourse plummets along with their traffic. The net result of the perverse magic of tech cartel censorship is only the wealthy few can afford to keep posting original content after they've been ghosted. Should Facebook, Google et al. reassure us we haven't been ghosted, why should we believe them? Since the entire apparatus of censorship is operated by private, for-profit corporations in complete secrecy, on what basis would their assurances be credible or verifiable? Just about the only bulwark against being silenced by the modern-day tech-corporate-NKVD-Stasi is Patreon--individuals who provide financial support of independent voices and analysis because they value those independent analysts and content creators. It doesn't matter whether you consider yourself left, right or center. If you want to resist secret censorship of both the left and the right, then please consider supporting the independent commentators and analysts who have enhanced your life with value, insight or entertainment. Thank you, patrons and financial supporters of oftwominds.com and other independent content creators. Thanks to you, the tech cartel can ghost us and our content but they can't erase it entirely. If you're not sure where to start, search Patreon.com for the names of those independent content creators you value. Consider subscribing to independent journals like Counterpunch magazine which is currently in a fundraising drive. I just re-upped (and also contributed to independent blogs I value)-- not because I agree with everything they publish but because I value their independence. Thank you, Melissa S. ($5/month), for your exceedingly generous pledge to this site -- I am greatly honored by your support and readership. Thank you, James R. ($5), for your most generous contribution to this site -- I am greatly honored by your support and readership. The value of local control and local capital far exceed the pathetic "savings" reaped from shoddy commoditized goods. What do we make of an economy in which a handful of bubblicious urban areas are magnets for jobs and capital while rural communities have been hollowed out? The short answer is that this progression of urbanization has been one of the core dynamics of civilization for thousands of years: opportunities are greater in cities, and so people move from rural areas with few opportunities to cities with greater opportunities. But that's not the only dynamic hollowing out America's rural communities: globalization plays a key role, too. Rural economies can rarely muster economies of scale that enable globally competitive enterprises. Rural communities generally lack the capital, expertise, global supply chains and cheap transportation costs that are the building blocks of successful global production and distribution. In a global economy characterized by over-capacity, over-production and mobile capital, localized rural economies can't compete with the low cost of commoditized products distributed by finely tuned global supply chains and cheap transportation. Pre-globalization and cheap transport, local bakeries imported bulk flour and baked bread that was lower in cost than loaves shipped in from afar. The local bakeries held the competitive price advantage, and so local bakeries could pay local labor and local taxes that then supported the rest of the local economy. But in today's economy, commoditized bread can be delivered rural communities at prices local bakeries cannot match. The same holds true for virtually all globally tradable goods-- foods, clothing, etc. The only economic sectors with a toehold in rural communities are corporate farms, the occasional small specialty corporate factory making non-commoditized components and non-tradable services such as hair salons, motels, thrift shops, cafes, etc. Proponents of globalization claim the few hundred dollars in annual household savings generated by shipping in commoditized goods are so beneficial nothing else matters. But if the cost of these paltry, essentially meaningless savings is the destruction of the local economy except for a handful of global corporate outposts and jumble shops, was this trade-off a good deal for rural communities? I have often discussed the tyranny of price: making the sticker price the sole arbiter of value distorts the concept of value to the point of meaninglessness. Proponents of globalization overlook the intrinsic value of local control and local capital. Once control of the local economy has been ceded to global corporations, the community has lost control of its destiny: the global corporation has only one goal and reason to exist: to increase capital and maximize profits by any means available. Once the local production can be undercut by production elsewhere in the world, the corporation will shutter the local facility and move on. Globalization has offered up the shoddy baubles of cheap goods at Walmart and Amazon at the cost of hollowing out local economies everywhere. 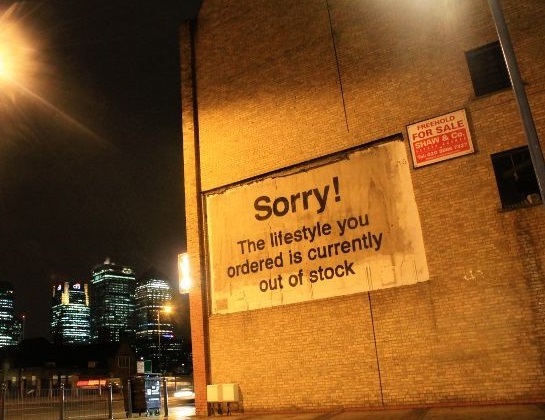 Those urban areas that specialize in globalized distribution, software, design and data attract mountains of global capital that then distort the cost structure to the point that only the already-wealthy can afford to live there. The value of local control and local capital far exceed the pathetic "savings" reaped from shoddy commoditized goods. At some point we might recognize this and act on it. We need to value honesty above optimism. Once we can speak honestly, there is a foundation for optimism. Beneath the rah-rah statistics of "the greatest economy ever," the social depression is accelerating. The mainstream is reluctantly waking up to the future of the American Dream: downward mobility for all but the top 10% of households. A 2015 Atlantic article fleshed out the zeitgeist with survey data that suggests the Great Middle Class/Nouveau Proletariat is also waking up to a future of downward mobility: The Downsizing of the American Dream: People used to believe they would someday move on up in the world. Now they’re more concerned with just holding on to what they have. I have been digging into the financial and social realities of what it takes to be middle class in today's economy for years: Are You Really Middle Class? The reality is that the middle class has been reduced to the sliver just below the top 5%--if we use the standards of the prosperous 1960s as a baseline. The downward mobility isn't just financial--it's a decline in political power, control of one's work and income-producing assets. This article reminds us of what the middle class once represented: What Middle Class? How bourgeois America is getting recast as a proletariat. This reappraisal of the American Dream is also triggering a reappraisal of the middle class in the decades of widespread prosperity: The Myth of the Middle Class: Have Most Americans Always Been Poor? Downward mobility excels in creating and distributing what I term social defeat: In my lexicon, social defeat is a spectrum of anxiety, insecurity, chronic stress, powerlessness, and fear of declining social status. The rising tide of collective anger arising from social depression is visible in many places: road rage, violent street clashes between groups seething for a fight, the destruction of friendships for holding the "incorrect" ideological views, and so on. I Think We Can Safely Say The American Culture War Has Been Taken As Far As It Can Go. We don't just self-sort ourselves into political "tribes" online-- we are congregating in increasingly segregated communities and states:. We need ways to express our resentment, anger, despair, etc. that are directed at the source, the complex system we inhabit, not "the other." We need to value honesty above optimism. Once we can speak honestly, there is a foundation for optimism.